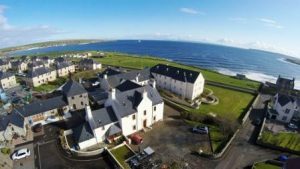 Pentland Lodge House is conveniently located on the west side of Thurso (on the way to Scrabster). 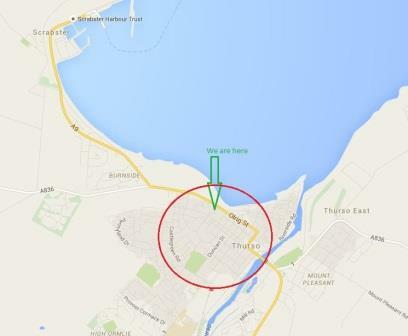 The map shows our location and the circle represents approx. 1 mile diameter. Despite being close to the centre of town our bed and breakfast is in a very quiet residential area with little passing traffic. Inside the circle is the train station, the town centre including lots of places to eat and the best surfing beach in Britain. As you can see Scrabster (ferry to Orkney) is not far. Drone photograph of the house, showing just how close we are to the sea. View from the window in ‘Middleton’. The centre of town is a short stroll away where you can find restaurants and shops. If you go via the beach and river you could see surfers, many varieties of bird, seals and if you are lucky, orca and otters. At night you may even see the Northern Lights. 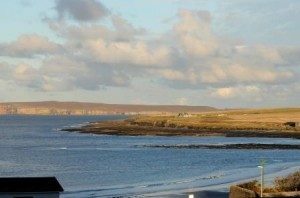 We have excellent tourist information for Thurso and the surrounding area in our information packs, along with home produced walking and driving tour guides. Please contact us if you would like any other tourist information – we want you to get the most from your holiday.